The extinct animal class of the Trilobita is chosen here to give an example of a new way of looking at the geological history. The Trilobites are a group of Paleozoic marine arthropods, which lived from the beginning of the Cambrian (545 my) up to the end of the Permian (245 my). The name tri-lobite (L. tri – three, + lobus, lobe) refers to the transverse as well as the longitudinal trilobation of the exoskeleton (fig. 67). Fig. 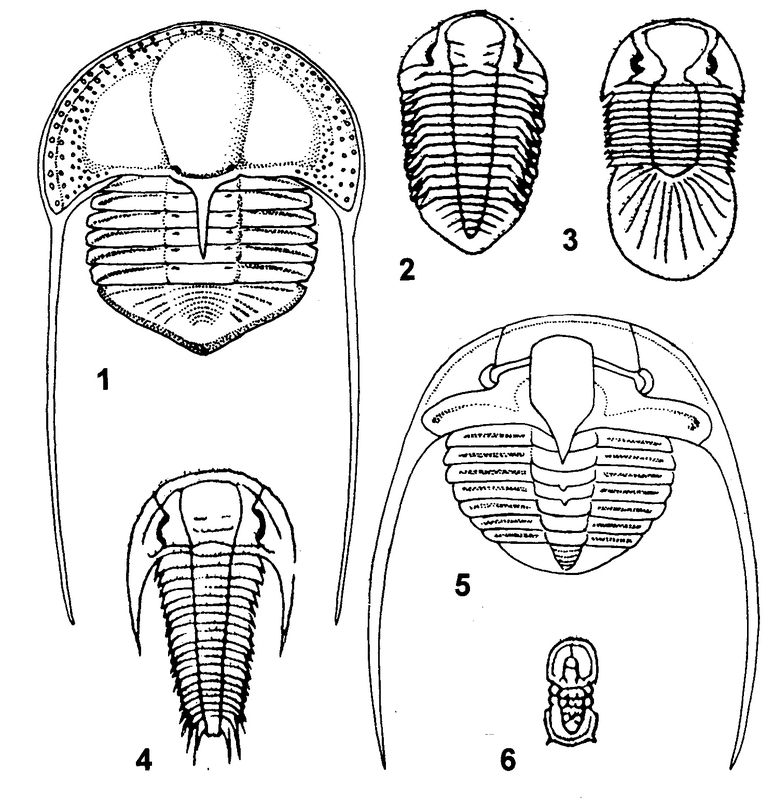 67 – Some examples of Trilobites from various ages. The Ordovician Cryptolithus has cephalic fringes with pits (1). The genus Acaste (2) is part of the Phacopina suborder and of Silurian age. The genus Scutellum (3) was found in rocks of the Lower Devonian. Paradoxides (4) from the Middle Cambrian is much older. The genus Orometopus (5) has long genal spines and dated from the Lower Ordovician. The genus Homagnostus (6) is a genus of the order Agnostida. They were diverse in the Early Cambrian, but died out at the end of the Ordovician. Trilobites have a hard outer skeleton, which contains carbonate and chitin. They periodically molted (ecdysis), like all other arthropods. Many trilobites were capable of curling their body for protection. A still growing and amended classification of the Trilobites contains more than fifteen thousand species (MOORE, 1959/1997). The average trilobite was small and looked like a bug, but larger examples are known, up to 70 cm. All trilobites lived in the sea, navigating in shallow water, walking on the bottom and probably feeding on detritus. Some, like the Agnostids, were swimming in deeper waters. The highly-developed forms in the early Cambrian were the dominant invertebrates of that time until the cephalopods displaced them in the Late Ordovician. There seems to be a trend towards a life in deeper water after the Ordovician, when many trilobite groups declined or went extinct. The Great Permian Extinction in the Upper Permian (245 mya) mend the end of all Trilobites. The fossil record of the class of Trilobita is, in a quadralectic approach, equated with the visible visibility period (X) on the CF-graph. The period of Trilobites occurrence, from the Lower Cambrian (545 mya) to the Upper Permian (245 mya), covered some 300 million years. This duration is accepted as a given empirical fact (which is, in a true scientific spirit, always open to correction if new data prove otherwise). The length of the basic unit (BU), i.e. the length between two inflection points, can now be calculated. This length is 1/16th V, and works out for the Trilobites as 30 million years. There was a sudden advanced stage of development in the Lower Cambrian rocks, but it seems certain that the Trilobites had a long pre-Cambrian history, possibly as soft-bodied creatures without much of an integument. At several localities, sedimentary rocks with trace fossils of trilobite activity underlie the oldest rocks with trilobite body fossils. The actual ‘beginning’ of the Trilobites becomes for that reason an awkward topic. The beginning of the Trilobite V-cycle – some 695 mya – coincides with the beginning of the Vendian period – and is a purely theoretical affair. The same holds for the actual ‘end’. The empiric end of the visible visibility (area X) is fixed some 245 mya in the cataclysmic events at the end of the Permian, but there were still some 30 millions years of (theoretical) ‘existence’ to go. The formal end of the CF-graph is positioned in 215 mya., i.e. somewhere in the middle of the Trias. It has to be understood that the relative differences between the practical (empirical) and theoretical boundaries (of the visibility of the Trilobites) are pack-and-parcel of a quadralectic approach, where nothing is absolute. The differences are a reflection of two positions in a communication: either in the third (static) or fourth (dynamic) quarter of the Fourth Quadrant. The abbreviations of the inflection points on the CF-graph are as follows (in the general appraisal of the graph, see p. 122, fig. 51): FV = First Visibility; AP = Approach Point; FMA = First Major Approach; FVC = First Visibility Crisis; PP = Pivotal Point; SVC = Second Visibility Crisis; SMA = Second Major Approach; RP = Receding Point and LV = Last Visibility. It is interesting to compare these inflection points – and their meaning in a quadralectic communication – with the description of the evolutionary development of Trilobites as given in the textbooks. The history of the Trilobites becomes in this way a sequence of approach (intensio) and recession (remissio) between a class (of animals) and an observer. 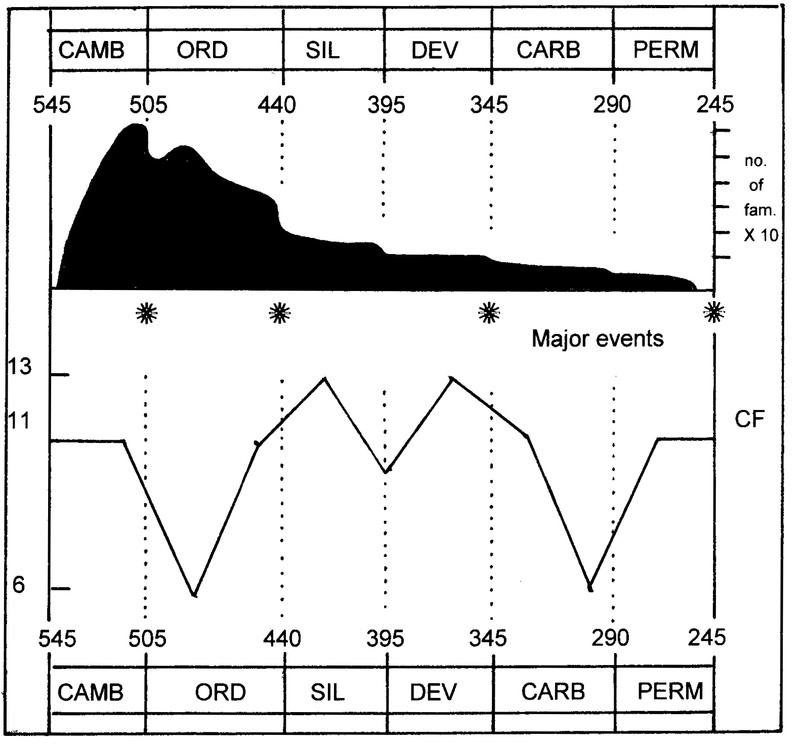 The Trilobites go through a cyclic interaction and their ‘ups and downs’ – as described in the classical geological textbooks – can be marked on the CF-graph (fig. 68). The specifics of the CF-graph itself – as briefly given on p. 122ff, fig. 51) – can be reciprocal be projected on the familiar history of the Trilobites in time. The interaction between these two approaches, one from the ‘given history’ and one from the ‘characteristics of the CF-graph’ have to merge in order to come to a full quadralectic understanding. The modern way to describe the (geological) history has to come to a contemplated compromise between these two approaches. None of these accesses has a priority: the ‘textbook history’, derived from a maximum number of authorities, is equal to the ‘framework of the CF-graph’, decided upon after a choice from as many sources as possible. Fig. 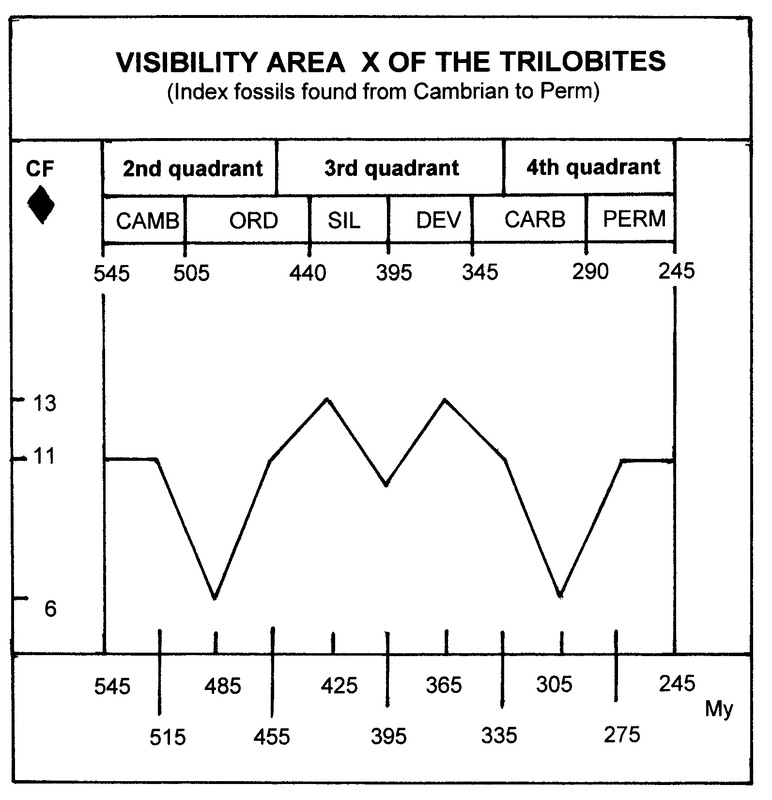 68 – The (visible) visibility area X of the CF-graph for the extinct Class of Trilobita. These Arthropods lived from the early Cambrian to the end of the Permian, i.e. from around 545 to 245 million years ago, a time span of 300 my. The greatest number and diversity of forms of the Trilobites occurred during the Cambrian and Ordovician periods. This expansion is positioned in the Second and the first quarter of the Third Quadrant of the communication. The Trilobites were truly part of the ‘Cambrian Explosion’. This popular term is used for the ‘sudden’ appearance of Larger Animals at the beginning of the Cambrian. The sheer quantity of specimens made it possible to divide the Cambrian system in stratigraphical units solely on the base of Trilobites (CLARKSON, 1979). The number of families reached a maximum of around seventy in the Upper Cambrian (fig. 69). A first ‘crisis’ occurred soon thereafter when a number of non-specialized genera perished. A possible cause was a regression of the sea level and/or the appearance of more efficient animals. Fig. 69 – The number of Trilobites families during their existence on earth from the Lower Cambrian to the Upper Perm. A part of the CF-graph (visibility area X) is drawn as a comparison. The end of every period also implied a diminishing number of Trilobites families, with major reduction at the end of the Ordovician and the Devonian. This phenomenon was not a coincidence, since it must be remembered, that these boundaries find their very origin in the changes of a fossil record like the Trilobites. The first major decline of species started at the end of the Ordovician (440 mya) in favor of the Cephalopods. The Agnostida, Olenina, and certain Asaphida completely disappeared from the scene. The extinction of a number of Trilobites groups was part of a major event, which also reduced the biodiversity of organisms like the Bryozao, Brachiopods, Corals and the Graptolites. The transition from the Ordovician to the Silurian was marked by higher sea levels, probably due to the partial melting of Ordovician glaciers. Subsequently, the sea levels began to drop again in the Late Silurian in much of the world. Plate tectonics caused mountains to form. This unimaginable and gigantic event is known as the Caledonian orogeny. The actual First Visibility Crisis (FVC) in the fossil record of the Trilobites lies around 425 mya, which is in the Lower to Middle Silurian. This particular inflection point, known as a ‘psychological’ crisis in a universal communication, happened some fifteen million years after the termination of the Ordovician. The Trilobites had to face new enemies in their reduced territories such as sea scorpions of up to 1.5 meters (Eurypterus remipes) and the first jawed fishes (Acanthodians). No wonder that the supremacy of the Trilobites got dented in the company of such fierce creatures! They did no longer ‘rule the waves’ and their importance was taken over by the fishes. The history of the earth between 400 – 350 mya is, for that very reason, called the ‘Age of Fishes’. A majority of the Trilobite families continued to the end of the Devonian (345 mya), when rough times appeared for the second time. This boundary is situated some twenty million years after the Second Visibility Crisis (SVC), which occurred 365 mya. This inflection point is characterized – in a general quadralectic model – by the occurrence of visible (material) damage within the communication. The advent of sharks and other early fishes might have contributed to the demise of the Trilobites (SHROCK & TWENHOFEL, 1953; p. 601). The number of families and species was greatly reduced in the Carboniferous and Permian periods. The three primary divisions of the body and the three-lobed longitudinal division of the Trilobites remained constant over the whole duration of their geological presence. Occasionally, there were changes in size (from humble beginnings as Agnostida to the larger specimen, which were too big for predators to handle) and a wide variation in eyes, thorax, spines and other morphological features, but the basic triple building plan remained the same. The triple division of head, body and tail resulted in a versatile, marine animal, which was capable of surviving radically changes in the history of the earth and showed an amazing adaptability on a local facies scale. The appearance of the first Tetrapods in the Devonian was more than just another group of animals appearing on the scene. The introduction of a four-fold plan (Tetrapods) in stead of a tri-fold (Trilobites) proved a challenging innovation of nature and a more serious threat to the Trilobites in the long run. This event happened at the pivotal point (PP = 395 mya) of the Trilobites visibility area X. The four-fold configuration offered an option to further development of form and function. The quadralectic adagio ‘not too few and not too many’ is not only the hallmark of tetradic apprehension, but also fits the principal characteristics of nature-in-general. A further refinement in two pairs of ‘opposites’ (arms and legs) – working together as a unit – proved enormously effective. This change from a trifold- to a fourfold plan was part of the main morphological development in the Large Visible Animals (LVA) in the geological history. The extinct group of the Trilobites played a modest, but important part in the biological expansion of life from its early beginning to the world as it is known today. The three-division proved extraordinary successful in an environment, which was open for discovery and boundless activity. Somewhere along the (time) line, some three-hundred-and-ninety-five millions year ago, a better concept cropped up, based on the four-division. The reason for this ‘jump’ will always be a mystery.